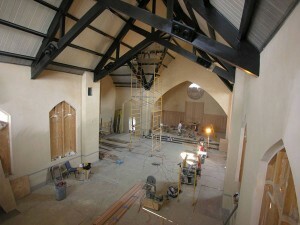 Church Interiors has a professional network throughout the nation of over 300 Master Painters. Our specialty is painting monochromatic color schemes. Beautiful architectural features and ornate moldings often go unnoticed during church renovations. Our master painters are experienced and are able to repair and paint in a way to enhance these features. Our craftsmen offer the very best in protection regarding the proper handling of pews, other furniture and instruments to insure that your church's renovation or restoration is completed to perfection. A specialized trade like plaster finishing and repair requires special techniques and materials. Cracks will return in 3 - 6 months with typical drywall patching. However, using elastomeric plaster compound and elastomeric finish coats are required to give the surface flexibility. Be aware that proper plaster repair and necessary prep work will take our master painters twice as long as painting. That means if painting will take 2 weeks, the plaster repair and prep work portion of your church renovations or restoration project will take up to 4 weeks. An experienced craftsman must be the one to perform plaster repair and they should have at least 5 years of plaster repair and finishing experience. In order to obtain a solid foundation, any loose plaster must be removed prior to applying the new plaster. It is not recommended to perform surface patching and skim coating cracks. Learn more about how Church Interiors can offer you the best renovation or restoration results by repairing and painting your church properly.